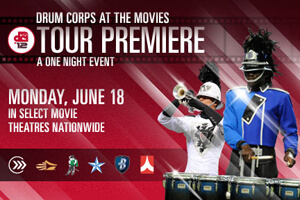 Drum Corps International is returning to movie screens nationwide with Drum Corps at the Movies: 2012 DCI Tour Premiere, on Monday, June 18 at 6:30 p.m. local time. Kicking off DCI's 40th anniversary summer season, the cinema event will showcase six top marching music ensembles. Pre-recorded live on Saturday, June 16 in Akron, Ohio, this season-opening event will ignite the competitive fire between the Blue Stars (La Crosse, Wis.); Phantom Regiment (Rockford, Ill.); The Cadets (Allentown, Pa.); Carolina Crown (Fort Mill, S.C.); Bluecoats (Canton, Ohio); and The Cavaliers (Rosemont, Ill.). Tickets for the 2012 DCI Tour Premiere are available at presenting theater box offices and online at FathomEvents.com. For a complete list of presenting theater locations and prices, please visit the website (participating theaters may be subject to change). Presented by NCM Fathom Events and DCI, this event will be broadcast to nearly 550 select movie theaters across the country through NCM's exclusive Digital Broadcast Network. "Now in its ninth year, Fathom's DCI events continue to transport audiences from their local cinema to the field alongside all of the competitive action," said Shelly Maxwell, executive vice president of NCM Fathom Events. "This year's anniversary event will showcase performances by the most talented marching musicians in the country." NCM operates NCM Media Networks, a leading integrated media company reaching U.S. consumers in movie theaters, online and through mobile technology. The NCM Cinema Network and NCM Fathom present cinema advertising and events across the nation's largest digital in-theater network, comprised of theaters owned by AMC Entertainment Inc., Cinemark Holdings, Inc. (NYSE: CNK), Regal Entertainment Group (NYSE: RGC) and other leading regional theater circuits. NCM's theater advertising network covers 181 Designated Market Areas® (49 of the top 50) and includes over 19,000 screens (approximately 17,800 digital). During 2011, over 670 million patrons (on an annualized basis) attended movies shown in theaters in which NCM currently has exclusive, cinema advertising agreements in place. The NCM Fathom Events live digital broadcast network ("DBN") is comprised of over 700 locations in 167 Designated Market Areas® (including all of the top 50). The NCM Interactive Network offers 360-degree integrated marketing opportunities in combination with cinema, encompassing 42 entertainment-related websites, online widgets and mobile applications. National CineMedia, Inc. (NASDAQ: NCMI) owns a 48.6% interest in and is the managing member of National CineMedia LLC. For more information, visit NCM.com or FathomEvents.com.